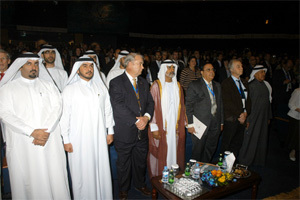 The 2nd International Conference on Drug Discovery and Therapy (ICDDT) was held from February 1 -4, 2010 at Dubai Men’s College, UAE. ICDDT 2010 was the second edition of this major international conference and exhibition, which aimed to present cutting edge advances in various disciplines on drug discovery and new therapeutics. The 2nd ICDDT proved to be a major pharmaceutical and medical research event of the UAE and was covered by the print and electronic media of the region. The conference hosted over 700 pharmaceutical scientists, doctors and clinical researchers who discussed the latest global breakthroughs in drug discovery and therapeutic research. Leading industrial and academic experts from 74 countries around the globe presented their findings in the form of Plenary Lectures, Invited Lectures, Session Lectures and Posters at this four-day conference. The conference agenda included more than 300 talks and 250 poster presentations in 23 conference tracks. There was a parallel commercial exhibition where both local and international companies exhibited their products. The 2nd edition of ICDDT provided a platform for all pharmaceutical scientists, internists and primary care physicians to discuss and learn about all the important international breakthrough developments on drug discovery and new therapeutics. The impressive inaugural ceremony of the event commenced on Feb. 1, 2010. His Excellency, Sheikh Nahayan Mabarak Al Nahayan, Minister for Higher Education and Research (UAE) and Chancellor of HCT, was the Chief Guest, who welcomed and appreciated the combined efforts of Eureka Science and Higher College of Technology for organizing such an event of multidimensional importance. In the opening speech, his Excellency, Sheikh Nahyan, said, “the UAE, ever since it was established 40 years ago as a federation, has been making all efforts to promote creativity and values innovation and is committed to building a knowledge-based society where ideas drive economic success and help affect positive change.” The minister noted that a large number of people around the world face a host of problems such as obesity, heart disease, cancer and communicable and infectious diseases. He said that these diseases are caused by poverty, poor eating habits, lack of clean water and healthy foods and are also genetically related. He stated drug design and discovery to be a global issue where all nations of the world share the same challenges and concerns. The pharmaceutical industry, he added, is now largely dependent on information and data in its efforts to understand the molecular structures of pathogens. He noted that currently there are drugs being designed and manufactured to treat particular diseases. The conference witnessed global participation from academia and industry. 731 delegates from 74 countries attended the conference. 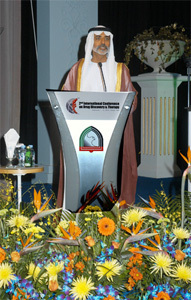 During Feb. 1 thru 4, 2010, speaker sessions were held in eight halls of Dubai Men’s College. All the sessions were well attended and appreciated by the participants. Posters presentation was also conducted simultaneously during the lecture sessions, where the presenters displayed their posters, which were attended by a large number of delegates during the lunch and coffee breaks. Among the anti-infective drugs which have recently been approved for clinical use, the antiviral agents, following the trend set by anti-bacterials (antibiotics) a few decades ago, have taken the lead. In recent years, more than forty antiviral compounds have been formally licensed, more than half of which are used in the treatment of human immunodeficiency virus (HIV) infections (AIDS). Others have been licensed for the treatment of herpesvirus infections, hepatitis B and C, and influenza. For other virus infections, i.e. pox (variola, vaccinia), hemorrhagic fever virus, picornavirus, flavivirus, papilloma- and adenovirus infections, effective antiviral drugs still have to be developed or submitted to clinical trials. Even for those virus infections that can already be controlled by therapeutic modalities, the search for additional molecular targets and new treatment strategies should be pursued. The development of antiviral agents requires a multidisciplinary approach encompassing many different fields, such as molecular modeling, medicinal chemistry, biochemistry, pharmacology, toxicology and clinical medicine. Most importantly, the development of antiviral agents may learn from (and should not been dissociated from) other anti-infectives, in particular those compounds targeted at bacterial infections (i.e. tuberculosis) and protozoal infections (i.e. malaria) and other parasitic diseases, as evidence is growing for compounds trespassing these borders, both from a structure-activity relationship (SAR) and mode of action viewpoint. Highly active antiretroviral therapy (HAART) has changed the landscape of HIV-related care in both the developed and developing countries. The availability and widespread use of HAART have resulted in a number of achievements as well as challenges. Since the early days of antiretroviral therapy, adherence has emerged as a milestone to success. There are factors militating against adherence to antiretroviral therapy among HIV-infected individuals particularly in the resource - limited settings. Limited laboratory infrastructure, lack of trained manpower and high cost of laboratory monitoring test pose a major problem to implementing HIV therapy in resource-poor settings. The disclosure of HIV serostatus is a difficult emotional task creating opportunity for support and rejection. The second ICDDT was held in Dubai in February 2010 addressing all areas pertinent to this endeavour, concentrating on leads that arise from highly active antiretroviral therapy, effect on the quality of life, laboratory monitoring of patients on HAART and HIV serostatus disclosure. There were presentations in varying subjects of Anaemia, Comparative analysis of malaria parasite density using actual and assumed white blood cell counts, Reference percentiles of haematological and biochemical iron values of blood donors, Prostate cancer diagnosis, Anti-microbiological drug resistance and other interesting topics in the area of Biomedical Science. The list catered to a number of contributions that stem from other sources, aiming to provide a well-informed and productive forum for examination of as wide a range as possible of approaches developed in disparate laboratories worldwide. Cardiovascular diseases, including thrombosis, dyslipidemia, arrhythmia, hypertension, metabolic disorder, diabetes, heart failure and numerous other conditions, are the primary cause of significant morbidity and mortality in the world. The impact of cardiovascular diseases is expected to rise in geometric proportions as life expectancy rises, in both economically advanced and economically challenged countries. Addressing current and future cardiovascular diseases involves a multifaceted approach including understanding physiologic mechanisms at molecular and cellular levels, designing agonists/antagonists using computational, combinatorial, traditional structure-activity relationship-based or natural products-based approaches, and investigating pharmacological and toxicological effects of potential drugs through in vitro and in vivo systems. The Cardiovascular Discovery Track at the Second International Conference on Drug Discovery and Therapy provided an outstanding avenue for the disclosure of recent results in target identification and optimization, lead identification and optimization, and initial results in animal and human studies to an international audience representing basic and clinical scientists from academia, industry, government, and business organizations. Cancer remains the second leading cause of death both in industrialized and non-industrialized countries and is increasing in incidence elsewhere in the world as the population ages. The enormous advances in knowledge, science and technology in the 21st century have facilitated the process of globalization with the aim of better quality of life for all. The development of more effective, efficient, less risky and less toxic drugs for treatment of cancer has been a major human endeavor for the past 50 years. With the introduction of the “targeted drugs” and currently available treatment regimens, 5-year survival rate among the adults for all cancers has increased to approximately 65%. The improvement in the survival rate of childhood leukemia (ALL), being the most fatal childhood cancer, over the past 35 years is one of the great success stories of cancer treatment. In the 1960s, while less than 5 percent of children with ALL survived for more than five years, today, about 85 percent of children live five years or more. The 2nd International Conference on Drug Discovery and Therapy was an effort to address all areas towards anti-cancer agents. Emphasis was given to drugs that have recently been introduced into the cancer therapy including: inhibitors of chromatin function, target-based inhibitors of signal transduction (tyrosine kinase inhibitors) and cyclindependent kinases, and angiogenesis inhibitors acting on metalloproteinases, epithelial cell growth, and angiogenesis stimulation. There were presentations from contributors working on hormone synthesis inhibitors and hormone-receptors blockers, RNA interference, role of pharmacogenomics in anti-cancer drug development and computer aided-strategies for anti-cancer drug design and development and related areas. Anti-cancer drug development is a major area of research. It was found that the estimated approval success rate for self-originated new chemical entities from 1981 to 1992 varied from 19% to 30% with an increasing trend currently. Therefore, most drugs undergoing trials are abandoned without obtaining marketing approval, which also proves that it is a risky, tedious process and the financial resources involved are tremendous. New anticancer drugs undergo various clinical trials, which answers specific questions pertaining to new therapies or new ways of using known treatments. There are many techniques which can evaluate anticancer drug. Functional imaging techniques provide a novel method for anti-cancer drug development and monitoring response to therapy. New chemotherapeutic drugs are continuously being developed. Some of them, which target the biological processes, can be monitored functionally using Positron Emission Tomography (PET), functional MRI, Multiphase CT etc. These techniques provide significant knowledge regarding pharmacodynamic and pharmacokinetic endpoints of these drugs. PET-CT imaging is a superior method in new drug development as it is a noninvasive imaging modality and provides an early judgment for principle animal and human trials. The current end point for assessing response to therapy in solid tumors is by measuring the change in tumor size. Tumor volume change as calculated by ultrasound, computed tomography or magnetic resonance imaging using unidimensional or bidimensional measurements and comparison with baseline pretreatment scans, has been used for assessing tumor response to anti-cancer drugs up to date. However, tumor dissolution and shrinkage are a complex cascade of cellular and subcellular changes that occur over a period of time, usually weeks or months, thus precious time is lost in assessing the response using conventional imaging modalities. Therefore, functional information such as drug induced changes in tumor glucose metabolism, tumor cell proliferation and perfusion, derived from PET imaging using radiolabelled biological probes, provide an alternative approach to conventional structural or anatomical imaging. This functional information is particularly going to be helpful in predicting treatment response to new immunomodulating drugs which target cancer growth via its effect on proliferative signal transduction, cell cycle progression, growth factors, telomere regulation, apoptosis, angiogenesis, tumor invasion and metastatic capacity. Drug discovery, as a field, has evolved into a process that not only involves the scientist; but also many other tangential fields such as physicians, legal experts, business individuals, etc. One portion of the drug discovery effort that is of particular challenge is that pertaining to neuroscience. This is mainly due to not only the complexity of the nervous system, but also the relatively poor understanding of most psychiatric and neurological diseases. Despite this, the worldwide market for CNS disorders was estimated to be $50 billion in 2001 and is set to grow to the aging population, due to better diagnostic procedures. However, although the process has become multi-variant over the years requiring billions of dollars to be spent for each successful launch of a drug; the heart of the matter still remains to be target identification/validation and lead discovery/optimization. In the 2nd International Conference on Drug Discovery and Therapy held in Dubai in February 2009, CNS (Pre-clinical Section) addressed the major contributions toward CNS research that arises both at the industrial setting as well as the academic setting. The section will try and have a cross-section of both basic research as well as more applied (translational) research that highlights the amount of work being produced at all research sites. It has been predicted that central nervous system (CNS) disorder will be the major medical need of this century. In spite of this recognition and the tremendous effort and money invested in CNS drug discovery, the outcome has been very limited over the last decade. Since the underlying genetic and neuronal abnormalities in most psychiatric and neurological disorders are largely unknown, identifying potential pharmacological targets is particularly difficult. Furthermore, clinical evaluation of drug candidates is challenging as objective measures of symptoms of CNS diseases are frequently lacking. Therefore, adequate evaluation of the outcome, or early sign of clinical improvement of pharmacotherapeutic intervention is also complicated. Although lectures and presentations from all areas of CNS drug discovery and clinical development were welcome, a particular emphasis was placed on translational medicine. The aim was to address some of the above listed difficulties related to the discovery of CNS medicines, while also covering hot topics, such as clinical dose selection and biomarker strategies. During the past two decades, diabetes has become one of the most alarming public health problems. The rapid increase in the prevalence of obesity, type-2 diabetes and associated complications (diabesity) is a major global health problem worldwide. Evolution suggests the inevitability of the passage of "thrifty genes" from generation to generation, providing protection during times of famine but predisposing the carriers of these genes to obesity and type 2 diabetes in times of plenty. The close relationship of obesity and type 2 diabetes with a cluster of cardiovascular risk factors has produced the terms "diabesity" and "metabolic syndrome." Diabesity is a challenging condition that requires an integrated understanding of diabetes and obesity, as well as a coherent management plan that will drive forward effective measures for both prevention and intervention. To prevent and treat diabesity, there is a need to develop approaches to modulate the ways in which the body controls metabolism, body weight and composition. The conference brought together basic and clinical scientists aiming at identifying new factors implicated in obesity and diabetes, and to develop strategies for validating these factors as targets for future pharmacological manipulation, as well as identifying possibly several new drug targets for the treatment and prevention of diabesity. There is undoubtedly much still to learn about diabetes and obesity. The 2nd International Conference on Drug Discovery & Therapy (2nd ICDDT), February 1-4, 2010, was a platform for twenty three tracks, each focusing on one therapeutic area. However, these tracks only covered those fields which are either considered to be important due to scientific interests or in terms of prevalence. Apart from them, there are many diseases and therapeutic areas which could not be covered in these tracks, but still have scientific interest & social merit. We therefore decided to include a separate track to include these diverse, but still interesting and important presentations. The track entitled, “Developments in Other Therapeutic Areas” had invited and short presentations, as well as, poster presentations by leading experts in various fields on a broad range of topics, such as intellectual property, Endocrinology, Metabolics (Renal + Urology), gastrointestinal Diseases, Radiology, Gerontology / Aging, Opthalmology, Hematology, Pediatrics, Dentistry / Oral, Dermatology, Allergy, Behavorial Health, Men’s Health issues, Rheumatology / Arthritis, Orthopedics, Obstetrics & Gynecology, Respiratory Disease, Reproductive Health etc. Many biologically active molecules are very active in vitro, but never reach the clinic because of lack of absorption and/or poor in vivo stability. Although a range of delivery systems is available, the delivery of sensitive drugs such as peptides, nucleic acid based therapeutics (including antisense DNA and siRNA), simple and complex carbohydrates, and synthetic vaccines presents a major challenge to the pharmaceutical industry. Industry experts agree that approximately 10% of the costs of drug development program should be allocated to aspects of drug delivery. New developments in drug delivery research are likely to have enormous economic impacts upon the pharmaceutical and biotechnology industries. In fact, drug delivery research represents a US$70 billion a year industry. Centres for Drug Delivery have been established all over the world to promote research, development and training in drug delivery science. There has also been a focus on realizing the commercial potential of innovative molecules (e.g. peptides, nucleic acid based therapies and vaccines) or delivery technologies that are developed from the centres’ research. Research in drug delivery is multidisciplinary, requiring knowledge of how drugs work, their chemical and physical properties, how these properties affect the drugs in vivo behaviour, and what could be done to potentially solve any delivery problems associated with drug molecules. Therefore, drug delivery research necessitates interdisciplinary collaborations both at a national and international level. Currently, there are no drugs supported by sufficient evidence of efficacy for cerebral vasospasm in patients with subarachnoid hemorrhage, despite abundant evidence of anti-vasospasm drugs at an experimental level. We have developed a drug-delivery system using a vasodilating drug that can be implanted intracranially at the time of surgery for aneurysm clipping, without systemic side effects or side effects associated with long-term intrathecal drug administration through indwelling catheters. We started our project in 1994 for making slowly-releasing drug-delivery system in vitro, because cerebral vasospasm occurs 4-14 days following subarachnoid hemorrhage. A rod-shaped pellet (1 mm in diameter, 10 mm in length, containing 1 mg of nicardipine) for animal study was prepared by heat compression. Release curve from the pellets was adjusted similar to the time course of cerebral vasospasm by changing the combination of molecular weight and lactic acid ratio of Copoly (lactic/glycolic acid) and nicardipine. We presented the efficacy and safety of this drug delivery system using both canine double hemorrhage and clot placement model. The mean concentration of nicardipine in the clots was 1.5x10-4 mol/L on Day 7 and 5.1x10-6 on Day 14. This drug delivery system can prevent vasospasm significantly in dogs, while maintaining an appropriate concentration of nicardipine in the clot adjacent to the arteries, since maximal relaxation is achieved by 10-6 mol/L of nicardipine. Since October 1999, nicardipine pellets (NPs) (2 mm in diameter, 10 mm in length, containing 4 mg of nicardipine) have been used to prevent vasospasm in patients with SAH. The study was approved by the University Ethical Committee, and informed consent was obtained. A frontotemporal craniotomy and a midline frontal craniotomy (pterional and anterior interhemispheric approach) were performed for aneurysms in the internal carotid artery (ICA), middle cerebral artery (MCA), basilar artery, anterior communicating artery, and distal anterior cerebral artery (ACA). NPs were placed in the cistern of the ICA, the MCA, and/or the ACA, where thick clots existed, and, therefore, vasospasm related to delayed ischemic neurological deficits (DIND) was highly probable. The number of pellets and the location of the placement depended on the amount and site of the subarachnoid clot in the preoperative CT scans, the operative field, and the craniotomy. Cerebral vasospasm was assessed by DIND, and angiography was performed in all patients on Days 7 to 12. We published a preliminary report on the efficacy and safety of NPs to prevent vasospasm in 20 SAH patients. Vasospasm was completely prevented in the arteries in cisterns with thick clots, where vasospasm was highly expected, by placing NPs adjacent to the arteries during surgery. In the first 100 patients treated with NPs, the ratio of DIND, severe angiographical vasospasm and cerebral infarctions was 7%, 11%, and 5%, respectively. No complications were experienced. Thirty-two patients with severe SAH and undergoing aneurysm clipping were included in the single center, randomized, double-blind trial in Germany. The incidence of angiographic vasospasm in proximal vessel segments was significantly reduced after implantation of NPs (73% control versus 7% NPs). Significant differences occurred also for the majority of distal vessel segments. Computed tomography scans revealed a lower incidence of delayed ischemic lesions (47% control versus 14% NPs). The NPs group demonstrated more favorable modified Rankin and National Institute of Health Stroke scales as well as a significantly lower incidence of deaths (38% control versus 6% NPs). We found that vasospasm is completely prevented in arteries in cisterns with thick clots, where vasospasm is highly expected, by placing NPs adjacent to the arteries during surgery. Lesser efficacy was found for arteries remote from the placement of pellets. Implantation of NPs improves clinical outcome of SAH patients. We consider that this could not be achieved by developing new drugs but by developing methods to maintain an appropriate concentration of the drug in the target cerebral artery and its surrounding environment. The pace and performance of modern drug discovery and development is based on effective use of a range of technologies. From initial screening to lead identification and drug delivery, emerging technologies are accelerating the drug development. These technologies are also contributing immensely to improvements in the quality and productivity of drug manufacturing. Nanotechnology and ICT are among the most exciting additions in the technology paradigm which hold great promises for future. It is expected that these technologies will not only decrease the cost of the drug development but also reduce the time required for a lead molecule to emerge as a drug for clinical use. This exciting track will showcase the R&D in emerging technologies to facilitate the drug discovery development process. Based on the very nature of the topic, the speakers and other presenters will include biomedical engineers, physicists, ICT experts, as well as medicinal chemists and health professionals. This important track will be of great interest for scientists, especially with reference to introducing new cutting edge technologies many of which are still not known widely. The 2nd ICDDT held in Dubai in February 2010 addressed all areas pertinent to this endeavor concentrating on leads that arise from application of the new knowledge at the cellular and molecular level. The other areas highlighted the impact of Nanomedicine (Application of nanotechnology in Human Health) on diagnosis and treatment of diseases. Nanomedicine is an emerging and expanding field with innumerable applications and may play an important role in translational research or moving from laboratory research to clinical practice. Both, Erectile dysfunction (ED) and Coronary artery disease (CAD) have similar Risk factors as: Age, Dyslipemia, Diabetes, hypertension, Smoking, lifestyle, Obesity and depression. As Graham Jackson et al. confirm, nine modificable risk factors are responsible for over 90% of acute cardiac presentations and all of them are also risk factors for ED. There for men with ED should be evaluated for CAD risk. Many studies try to demonstrate the relationship between ED and CAD with the evidence that ED may precede a coronary event by 2-5 years. A man over 40 years with organic ED is a cardiac patient? Who of them must be summated to cardiac study? A rapidly increasing body of data suggests an essential role of the endothelium in the normal function of the whole cardiovascular system, and consequently a major role of endothelial dysfunction in most cardiovascular diseases, sucha as atherosclerosis, pulmonary hypertension, and erectile dysfunction. The treatment of this endothelial dysfunction presents a major challenge to the pharmaceutical industry, challenge going from aspects of drug delivery, to drug efficacy and to potential new therapeutic fields such as endothelial progenitor cells. A generic drug is a compound or formulation which is produced and distributed without patent protection. Note, a drug company could have a patent on the formulation but not on the active ingredients, thus, it would be generic. In the United States (US), a generic drug must contain the same active ingredients as the original formulation. Plus, the US Food and Drug Administration (FDA) identifies and licenses as generic drugs those that are identical or within an acceptable bioequivalent range to the brand name counterpart with respect to pharmacokinetic and pharmacodynamic properties. The generic drug must act very similarly or the same as the brand name product. Thus, any generic considered by the FDA must be identical in dose, strength, route of administration, safety, efficacy, and intended use. Be aware that in the US off label use of drugs often occurs. For example, some anti-angiogenic drugs that are used in colon cancer have been used in ophthalmology for anti-angiogenesis. The economic aspect of generic products is that once they become available, the market competition results in significantly lower prices for the generic compound as well as for the original brand name product. Thus, there is a saving for the consumer. In general, US pharmaceuticals companies patent their drugs long before any clinical trial is initiated. Thus, although the US patent is given for 20 years, the effective life of the drug patent tends to vary based on the completion of the clinical trials. The range can be as short as 7 years of exclusive availability of the brand name product up to about 12 years. The pharmacological, therapeutic, medical, and legal aspects of generic drugs offer significant challenges and opportunities. Industry experts agree that both the brand name drug company (holding the patent) and the generic drug company have the potential to benefit due to the cost reductions. In some instances, there can be cooperation between the brand name company and the generic company. Also, in some select cases in the US, a generic drug developer can be given exclusive rights. This complex dynamic has both medical necessity and justification (legal) components. This can be a unique opportunity for a generic drug company. The development of generic provides has significant opportunities as well as challenges. The large pharmaceutical companies producing brand names and other companies producing generic products often have complex research and/or business paradigms that appear to be contradictory. If there were regulatory mechanisms in place that would assist both types of enterprises, all the consumers purchasing drugs would benefit. Although regulations can pose barriers, one hopes that in the future these guidelines will be such that they will afford opportunities and rewards for both companies that develop brand names and have patents and companies that produce and market generic drugs. Adoption of the ‘networked business’ model by pharmaceutical industry about 2 decades ago initiated the growth of the ‘Contract Research Organization’ (CRO) industry. From a market size of $ 2 billion in 1993 the CRO industry grew to $ 15 billion in 2005 and is envisaged to grow annually at a rate of 16% in years to come. What started as outsourcing of routine activities, such as synthetic chemistry in drug discovery, later stage clinical trial management and low cost manufacturing, have evolved into strategic outsourcing with focus on innovation and risk sharing. The extensive challenges brought on by escalating drug development costs, and late stage failures, are further strengthening the networked business model, wherein the pharmaceutical giants are looking for capacity and capabilities in a CRO not only for supplementing their in-house resources, but also for collaborative integrated discovery projects. While the growth & partnering opportunities for CROs are evident, the CRO industry having transcended from growth to maturation phase is besieged with its own challenges of slowing revenue growth, reduction in the number of CROs and fewer new clients. In these set of circumstances it becomes pertinent for the CROs to ensure that they are ready for the emerging high value opportunities and work out strategies to gain new expertise, find a niche either in a technology platform or therapeutic specialty, enter new growth markets or a combination of them, in order to effectively partner and help the pharmaceutical industry in meeting the challenges being faced by it. This session will feature six 30-minute Invited Lectures from diverse regions of the world: the Middle East, the Far East, Africa, Europe, North America and South America. Each speaker is to cover the status of biomedical research in their respective regions, especially as it relates to the discovery of new therapeutics and diagnostics for the public good. The very nature of pharmaceutical research has changed dramatically over the past decade, with globalization and networked interactions becoming more prevalent. In addition, there is an increased emphasis being placed upon diseases and disorders of the third world such as for the neglected diseases that afflict one-sixth of humanity. This track of the 2nd ICDDT promoted a more globally integrated review of pharmaceutical research. To explain the unresponsiveness of anti-TNF antibodies in the treatment of rheumatoid arthritis, essentially two phases of unresponsiveness might be identified: a primary phase directly after the start of treatment, and a secondary phase that develops in initial responders during the course of therapy. The primary phase of unresponsiveness is oriented on the pharmacodynamic and mechanistic aspects of drug intervention. The latter is explained by the formation of anti-drug antibodies (=anti-anti-TNF antibodies) in a subset of patients. This lecture addressed studies related to pharmacodynamic and immunogenicity issues of treatment with TNF-antagonists in RA towards personalized medicine approaches in rheumatoid arthritis. Nanotechnology has already begun to revolutionize medicine. Nanotechnology involves the use of materials with fundamental length scales in the nanometer dimension which demonstrate significantly changed properties compared to micron structured materials. Such materials can include particles, fibers, grain sizes, etc. This session highlighted the advancements nanotechnology is making in medicine in such fields as disease prevention, diagnosis, and treatment including (but not limited to) drug delivery, tissue engineering, implants, sensors, cancer treatment, and toxicity. Proteomics, the large-scale analysis of proteins, contributes greatly to our understanding of gene function in the post-genomic era. Proteomics can be divided into three main areas: (1) protein micro-characterization for large-scale identification of proteins and their post-translational modifications; (2) 'differential display' proteomics for comparison of protein levels with potential application in a wide range of diseases; and (3) studies of protein–protein interactions using techniques such as mass spectrometry or the yeast two-hybrid system. Proteomics technologies are under continuous improvements and new technologies are introduced. Nowadays high throughput acquisition of proteome data is possible. The young and rapidly emerging field of bioinformatics in proteomics is introducing new algorithms to handle large and heterogeneous data sets and to improve the knowledge discovery process. Peptide libraries offer a valuable means for providing functional information regarding protein-modifying enzymes and protein interaction domains. Crucially, new computational and biochemical tools have emerged that facilitate identification of interaction partners and substrates for proteins on the basis of their peptide selectivity profiles. Proteomics can be viewed as an experimental approach to explain the information contained in genomic sequences in terms of the structure, function, and control of biological processes and pathways. Proteomics attempts to study biological processes comprehensively by the systematic analysis of the proteins expressed in a cell or tissue. The field of Bioinformatics provides tools we can use to understand disease processes through the analysis of molecular sequence data. More broadly, bioinformatics facilitates our understanding of the basic aspects of biology including development, metabolism, adaptation, to the environment, genetics and evolution. The Regulatory Affairs track provided an insight into the latest trends and cutting edge technology in drug development from both the pharmaceutical/biotech industry and regulatory authority perspectives. As anticipated the presentations from the major regulatory agencies (FDA, EMEA, HC etc) and some of the GCC countries covered the regulatory aspects of drug development and drug life cycle, generic drugs and pharmacovigilance and risk management strategies. Delegates were given the opportunity to gain insight from presenters with substantial collective, regulatory and pharmaceutical industry experience and expertise. The field of translational research has been modeled most effectively in the oncology setting, where an unprecented number of new agents are being clinically tested and approved for use against specific malignancies. Impetus for this renaissance has come from the laboratory. Biochemistry and molecular biology have driven advances in understanding the molecular changes that are seen in cancer and have enabled the ability to pharmacologically target these changes. Drug targets in cancer encompass almost every aspect of cellular function, including cell surface expression of molecules, intracellular signaling events, protein degradation and even gene expression. An advantage of this generation of drugs is the fact that clinical trials may take into account whether the appropriate molecular target has been hit, thereby arming the next phase of drug development in improving the drug itself or choosing a better target. The most dramatic example of the success of these strategies has been in therapies for chronic myelogenous leukemia, a blood cancer which aberrantly expresses the BCR/ABL oncogene. Therapies inhibiting BCR/ABL action have changed the management and the clinical course of this disease. More importantly, the strategies utilized to develop these therapies have been adopted by translational researchers working to cure human disease inclusive of, but not limited to cancer. Every drug has a unique story on its journey from an idea to the marketplace. What is almost always the case though is that each drug has a champion, to help guide the concept and the drug compound through sometimes difficult waters. A company will often be completely reorganized, change management or be acquired by a competitor several times during the period when a promising compound is in late stage discovery or development. There are a number of marketed drugs, including Buspirone, Prozac, Acyclovir, Viagara or Paracetamol that may not have been come to light in modern laboratories. These drugs were invented by scientists relying often on instinctive invention and observation, who sometimes fought shy of formal systems. Many drugs are the product of serendipity, or "lucky" observations, but in fact the scientists involved often "made their own luck", by acting on seemingly disparate data to hunt for a new disease treatment. The session focused on some headline blockbuster drugs, some with well-defined and innovative mechanisms of action as well as some earlier stage compounds with a fascinating rationale and origin. During the talks it was illustrated how every drug is unique; but scientists need to have time and space as well as the motivation to observe and discover, by sound observation. The invention and development of a new drug rarely follows a prescribed pattern. The discipline of Drug-hunting requires determination, openness to new thinking, teamwork and the ability to link apparently disparate observations into a novel rationale. The impact of outstanding project leadership on the process of Drug Discovery and Development was illustrated as an important part of this session. In the last decade, drug options for different diseases are rapidly increased, but several of these latters remain a significant global health problem and an area of increased awareness among both patients and medical practitioners. Many scientific results have highlighted new targets for drug discovery, including inhibition of inflammatory mediators and newly formed proteins. Epidemiological and prospective studies have, also, potentially proposed the vital role of bioactive substances, present in the food, and/or set in the context of a dietary, in reducing the risk of cancer and cardiovascular diseases. In addition, the studies for evaluating new molecules to treat painful conditions are in progress. No pharmacologic interventions, such as antioxidants, deserve equal emphasis both in the prevention and treatment of several age-related diseases; therefore, their use as drugs could be useful. New developments in drug delivery research are likely to have important impacts on pharmaceutical and biomedical industries. It is evident that, for the complexity of the disease, strategies targeting different multiple systems involved in disease progression are required to maximize the therapeutic benefits of intervention. To this end, there are a number of approaches currently under active evaluation and for this; the interaction among scientists and industries is required. The last decade has seen a profound increase in our capacity to treat diseases and conditions affecting women. The discovery and development of new and more effective drugs have played a crucial role in this achievement. In the second ICDDT, recent advances made in the discovery of therapeutics and promising new hopes for the improvement of women’s health will be reviewed and discussed. Major areas that will be addressed include; treatment of infertility, endometriosis, preterm parturition and cancer. This cutting-edge project will involve multidisciplinary approaches from outstanding scientists across the world. Osteoporosis is characterized by reduced bone mass and alteration in bone architecture, resulting in increased fracture risk. These fractures are a major cause of morbidity and mortality in postmenopausal women and impose a huge economic burden on health services. Oestrogen deficiency plays a major role in the pathogenesis of bone loss and fracture in women. Other pathogenetic factors include reduced physical activity and vitamin D insufficiency. Several osteoporosis risk-factor screening tools have been developed to identify women at increased risk of low bone mineral density. A range of options is available for the prevention of fractures in high risk postmenopausal women and management of osteoprosis. These include the hormonal therapy, bisphosphonates, strontium ranelate, raloxifene and parathyroid hormone peptides, daily intake of calcium and vit D. Because of their broad spectrum of demonstrated anti-fracture efficacy, alendronate, risedronate, calcitonine and strontium ranelate are generally considered as the first line therapies for most of the women. The optimum duration of treatment for postmenopausal osteoprotic patients has not been established but the re-evaluation of risk and the need for continued therapy should be determined for these women in clinical settings. The compliance and persistence with long-term osteoporosis treatment is generally poor but may be improved by different dosing regimens. Rehabilitation approaches should be considered as the key components of prevention and treatment of osteoporosis. Maintenance of muscle function and balance, as well as daily vit D supplements and calcium intake should also be considered as the main therapies for fracture prevention. The 2nd ICDDT held in Dubai in February 2010 addressed all areas related with postmenopausal osteoporosis, concentrating on recent clues in pathophysiology and management strategies at the clinical level. In this session, there will be presentations concerned with the recent advances in pathophsiology of postmenopausal osteoporosis, the screening tools in determining postmenopausal women at the risk of developing osteoporosis, recommendations for prevention and treatment strategies in postmenopausal osteoporosis, adherence to drug treatment in postmenopausal osteoporotic female, patient satisfaction and quality of life in postmenopausal women treated with different groups of drugs, and fall prevention and rehabilitation of osteoporosis. This topic covered all aspects of postmenopausal osteoporosis and provided a well-informed and productive forum for understanding the basic mechanism of the postmenopausal condition and management approaches based on updated knowledge. 2nd International Conference on Drug Discovery and Therapy had four different kinds of planning and organizing bodies. These are being described below in order of their importance and responsibilities. Prof. Ferid Murad, Nobel Laureate and Prof. Atta-ur-Rahman, FRS were the joint presidents of this prestigious conference. Prof. Ferid Murad has received the 1998 Nobel Prize in Physiology or Medicine for discoveries related to the role of nitric oxide as a signaling molecule in the cardiovascular system. Born in Whiting, Indiana in 1936, Prof. Murad studied medicine and pharmacology simultaneously at Western Reserve University, receiving both his M.D. and Ph.D. in 1965.He was an intern and resident in internal medicine at Massachusetts General Hospital until 1967, and then worked until 1970 at the National Institutes of Health's National Heart and Lung Institute as a clinical associate and staff fellow. This followed a series of academic, research, and administrative appointments at the University of Virginia (1975-1981), Stanford University and Palo Alto Veterans Administration Medical Center (1981-1988), and Northwestern University and the University of Texas (starting in 1996). Prof. Murad has also worked in the pharmaceutical industry. From 1988 to 1992 he worked for Abbott Laboratories, becoming vice president of pharmaceutical research and development, and from 1993-1995. He was full-time president and chief executive officer of Molecular Geriatrics Corporation. Prof. Atta-ur-Rahman, FRS obtained his Ph.D. in organic chemistry from Cambridge University (1968). He has 784 publications in leading international journals in several fields of organic chemistry including 611 research publications, 15 patents, 99 books and 59 chapters in books published by major U.S. and European presses. Sixty eight students have completed their Ph.D. degrees under his supervision. Prof. Rahman, FRS is the first scientist from the Muslim world to have won the prestigious UNESCO Science Prize (1999) in the 35 year old history of the Prize. . He was elected as Fellow of Royal Society (London) in July 2006 thereby becoming one of the 5 scientists from the Muslim world to have ever won this honor conferred by the prestigious 360 year old scientific Society. He has been conferred honorary doctorate degrees by many universities including the degree of Doctor of Science (Sc.D.) by the Cambridge University (UK) (1987) and an Honorary degree of Doctor of Education by Coventry University UK in November 2007. He was elected Honorary Life Fellow of Kings College, Cambridge University, UK in 2007. He is the President of Network of Academies of Sciences of Islamic Countries (NASIC) and the Vice-President (Central & South Asia) of the Academy of Sciences for the Developing World (TWAS) Council, and Foreign Fellow of Korean Academy of Sciences Prof. Atta-ur-Rahman, FRS was the President of the Pakistan Academy of Sciences (2003-2006). Prof. Atta-ur-Rahman, FRS was the Federal Minister for Science and Technology (15th March, 2000 – 20th November, 2002) and Federal Minister of Education (2002). He was the Chairman of the Higher Education Commission with the status of a Federal Minister from 2002-2008. The Government of Pakistan has conferred four civil awards, including Tamgha-i-Imtiaz (1983), Sitara-i-Imtiaz (1991), Hilal-i-Imtiaz (1998), and the highest national civil award Nishan-i-Imtiaz (2002), on him and the Austrian government also honoured him with its highest civil award (Grosse Goldene Ehrenzeischen am Bande" (2007) in recognition of his eminent contributions. Prof. Atta-ur-Rahman, FRS is presently heading an OIC Ministerial Committee comprising the 57 Ministers of Science & Technology from 57 OIC member countries in his capacity as Coordinator General COMSTECH. Dr. Allen Reitz was the co-chairman for the Discovery section of the 23 different tracks of the conference. Dr. Reitz has had 27 years of experience as a medicinal chemist in the pharmaceutical industry, including nearly 26 years with Johnson & Johnson. He is a co-inventor as well as Team Leader in most cases of seven compounds that have entered human clinical trials, several of which are currently in the clinic (Phase I and II). He has ca. 130 scientific publications and 40 issued U.S. patents, and is the Editor-in-Chief of the journal Current Topics in Medicinal Chemistry. He has extensive experience in probe design and synthesis, target validation, hit triage, hit to lead and lead optimization medicinal chemistry, eADME profiling, and preclinical candidate selection. Dr. Reitz is located at the Pennsylvania Biotechnology Center in Doylestown, PA with research interests in the area of anti-infective agents, protein function and neurology (amyotrophic lateral sclerosis). Dr. Reitz is also the Professor of Chemical Biology in the Institute of Hepatitis and Virus Research. Scientific and professional activities include being a Medicinal Chemistry consultant for the Special Program for Training and Research in the Tropical Diseases (TDR/WHO), American Chemistry Society, and the Philadelphia Organic Chemists Club. 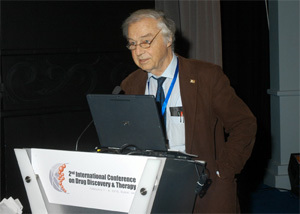 Dr. Christian Domingo was the co-chairman for the Drug Therapy section of the 23 different tracks of the conference. Dr. Christian Domingo is Consultant of Pulmonary Medicine at the Hospital de Sabadell (Corporació Parc Taulí, Sabadell, Barcelona, Spain), Professor of Medicine at the Autonomous University of Barcelona, Professor of the Department of Anatomy and Physiology of the International University of Catalonia and Professor of the Master in Health Economy of the University of Malaga. Dr. Christian Domingo is also Advisor to the Gerson Lehrman Group and Genatics Group. Dr. Christian Domingo studied at the Lycée Français of Barcelona and later on received his Medical Degree (M.D.) from the Universitat Autónoma in Barcelona, Spain in 1984. After taking the national board, he was admitted in the Hospital Universitari Germans Trias i Pujol of Badalona (Barcelona) where he completed his Residency in Pulmonary Medicine from 1986-1989. He was also trained at the Cardio-Pulmonary Transplantation Unit of the Methodist Hospital in Houston, Texas (USA) and l’Unité de Soins Intensifs in Lyon (France). Later on, he worked as a staff member of the Intensive Care UnIt at the Hospital Germans Trias I Pujol for three years, until 1992 when he became the staff member of the Pulmonary Service of the Corporació Parc Taulí. In addition to memberships and awards for his accomplishments in lung research, Dr. Christian Domingo has obtained more than 500,000 dollars in grants. He is also the director of several doctoral thesis of pulmonologists, internists and pediatricians. He is the member of the editorial board of international medical journals and the Editor-in-Chief of ‘The Open Respiratory Medicine Journal’. Jefferson-Pilot Professor of Neurobiology and Genetics, Director, Deane Drug Discovery Institute, Member, Duke Institute for Genome Sciences & Policy, President, Cabernet Pharmaceuticals, Inc. The Organizing Secretaries for the 23 tracks of the conference was the most active and important body directly involved in the selection, review and approval of submitted abstracts. They were responsible to solicit four Invited Speakers (30 minutes duration) and 15 Session Speakers (20 minutes duration) for their respective sections. Their most important job was the review and selection of submitted abstracts and approval of those which present cutting edge research and new therapeutic developments in the field. Below is the list of Organizing Secretaries of the pre-clinical and clinical tracks of the conference. The ‘Social Mixer’ was a cocktail party on the evening of the first day of the conference in the beautiful venue of Dubai Men’s College. The social mixer helped in creating an atmosphere that enabled the guests to relax, be comfortable in meeting new people, and exchange ideas with leading pharmaceutical scientists and researchers. The conference attendees came from a variety of backgrounds. The social mixer provided them an opportunity to get to know each other and discuss ideas, like a self-help seminar. It was a delightful evening for the visitors and they enjoyed a variety of light snacks along with fresh juice and mixed drinks. The ‘Gala Dinner on Dhow Cruise’ was the most exciting event of the conference. ‘Dhow Cruise’ is like discovering the true beauty of Dubai while being aboard a traditionally decorated wooden dhow (boat), as it sails along the Dubai creek under the moonlight. The major Dubai landmarks shone under the moonlit sky as the wooden vessel slipped silently across the creek. The past and present architecture of the area was at its absolute magnificence, including the National Bank of Dubai, Dubai Chamber of Commerce, Sheikh Saeed's house, and the Heritage Village. This unforgettable evening cruise included a buffet dinner of continental and oriental cuisine, with soft drinks and traditional coffee. The tour also contained various sorts of entertainment and traditional Arabic background music. Alcohol was also available on request at an additional cost. The Dhow Cruise lasted for 2 hours, between 7:30-9:30 pm. Guests were picked up at 7:00 p.m. from Dubai Men’s College and dropped at the hotels in the official buses. The event was sponsored by Sidra Medical and Research Center, BMWF - Bundesministerium für Wissenschaft und Forschung (The Austrian Federal Ministry of Science and Research), and Quintiles. The media partners included Bentham Science Publishers Ltd., Bio-Outsourcing Asia©, Business Monitor International, S. Karger AG, KAYZED Consultants, Pharma Agreement News, PharmaVOICE, Piribo, Report Buyer, and The Scientist. ICDDT has been a huge success with over 730 attendees across 75 countries, and a number of exhibitors and sponsors. Attendees enjoyed the ability to network with their peers, attend 8 concurrent sessions within 23 scientific disciplines, and view the latest research and technologies. The 2010 event has been a great accomplishment both in its conduct and impact. Being the second edition of such an international conference in the region, ICDDT has proved to be a progressive scientific forum, which will have far reaching impact on drug discovery and new therapeutics focused towards the treatment of specific diseases afflicting this part of humanity. At the same time, it has been a great success with its smooth conduct, wide range of subjects covered, participation of large number of delegates, fruitful deliberations and immense response of the participants towards discovering Drug Design and Dubai together. “After the outstanding success of the 1st International Conference on Drug Design and Discovery held in Dubai, UAE in February 2008, which was attended by 11 Nobel laureates, and 600 eminent scientists, the second ICDDT promises to be an even larger event with over 450 lectures in 23 thematic sessions, poster presentations and an associated exhibition. The conference will host leading scientists from academia and industry worldwide, to discuss the latest developments in drug discovery and therapy”. Truly, the 2nd ICDDT came up as the living example of this message and it has set up the stage for the success of future conferences coming up in the series.